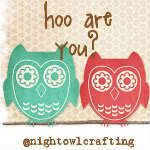 Dew THIS: Hoo are You? 1.What was your favorite meal growing up? BBQ Baby Back Ribs.. yummilicous and soo messy!! 2. What's your favorite month? December- I used to always say I would be married in December and I was!! Love the cold, the snow, ( came from growing up in Southern Cali and wishing we had it!) and you can't forget Christmas! 3. What store is most represented in your wardrobe? Rue 21- great sales and cute stuff! 4. How many times do you go to the movie theater each month/year? I am lucky to get to a movie once a year. I just like to Redbox them and lounge in my living with my jammies cuddling up with my hubby eating ice cream.... however, Harry Potter always calls my name!! draw anything other than stick figures. My sibelings have great talent in that area but its nilich for me!! 1. List 3 words that remind you of fall. 2. Do you wear jewelry often? always have my wedding ring (of course:), a CTR ring and its about 50/50 on earrings. I love necklaces but with little ones they aren't the easiest to wear. 3. Do you like your toe nails painted or natural? I love to paint them but then I just leave it until it looks nasty and then start all over! 4. Do you ever wear a hat? LOVE hats, don't wear them as often as I used to but LOVE to have them! 5. Do you have someone that you talk to everyday on the phone?